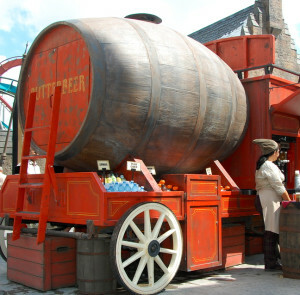 The Wizarding World of Harry Potter has several unique dining options to choose from. All dining locations and foods are uniquely themed to the Harry Potter books and movies and have been created in conjunction with JK Rowling herself. Dining at the Wizarding World is so authentic that you cannot purchase soda anywhere within Hogsmeade or Diagon Alley! You can only find Harry Potter themed beverages such as pumpkin juice, butterbeer, Gilly Water and for those who want something a bit stronger, a Hog’s Head Brew. As for dining, here are the best places to find a meal or snack at the Wizarding World of Harry Potter. Leaky Cauldron: Quick service restaurant open for lunch and dinner. One breakfast is also included with every Harry Potter package. If the breakfasts are not fully booked in advance, they will most likely take walk-ins as well. Florean Fortescue’s Ice-Cream Parlour: Grab your butterbeer ice cream here! A perfect way to beat the Florida afternoon heat. The Fountain of Fair Fortune: A bar that serves Harry Potter themed alcoholic and non-alcoholic beverages. You can also get butterbeer ice cream here as well as a Diagon Alley exclusive souvenir mug. 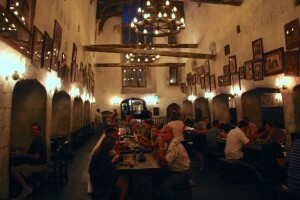 Three Broomsticks: Quick service restaurant open for lunch and dinner. One breakfast is also included with every Harry Potter package. If the breakfasts are not fully booked in advance, they will most likely take walk-ins as well. Honeydukes: Harry Potter’s favorite candy shop where you can buy everything from Bertie Bott’s Every-Flavour Beans to chocolate frogs. Great spot for a snack or edible souvenir. Street vendors: As you walk through Hogsmeade, you’ll find street vendors selling everything from ice cream(though not butterbeer) to Gilly Water to butterbeer. Very convenient if you’re looking for a way to cool off quickly.